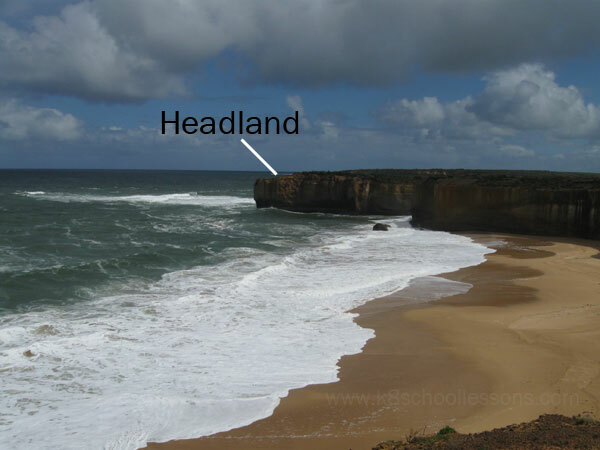 A headland is an area of high land that juts into the sea. 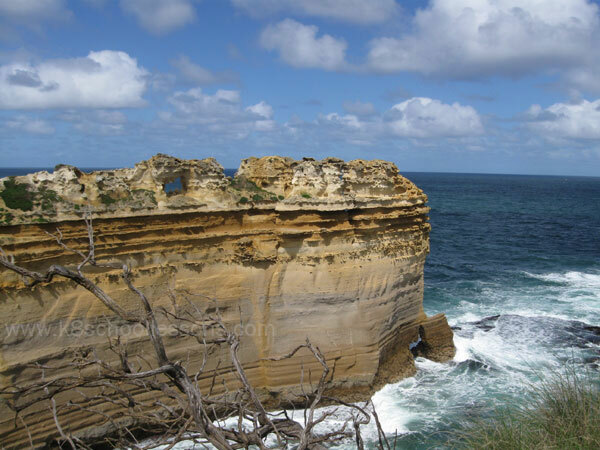 A picture of a headland at London Bridge aka London Arch on Great Ocean Road, Victoria, Australia. 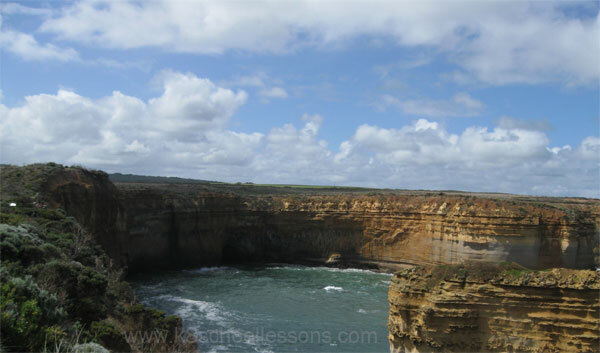 A picture of a headland at The Razorback on Great Ocean Road, Victoria, Australia. A cliff is a steep, vertical face of rock, earth, or ice, formed by erosion from weathering or by the action of water or ice. 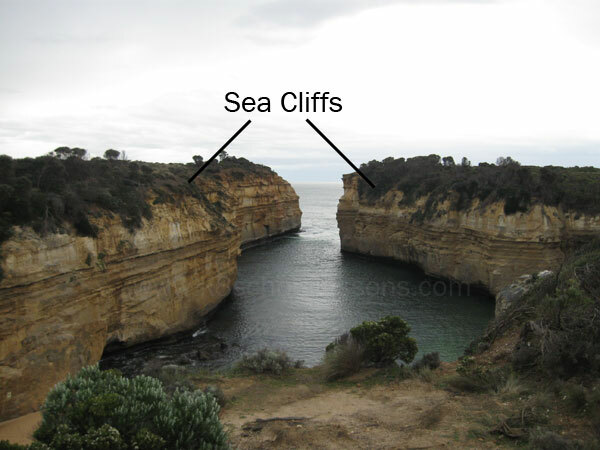 A picture of sea cliffs at Loch Ard Gorge on Great Ocean Road, Victoria, Australia. A cove is a small, sheltered bay of an ocean or a lake. A picture of a sea cove at The Razorback on Great Ocean Road, Victoria, Australia. 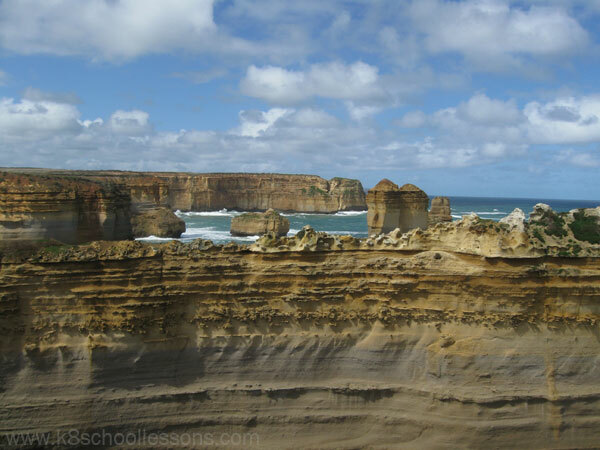 A sea stack is an isolated promontory (headland) of rock along the coast, formed from a sea arch that has collapsed because of the action of waves. 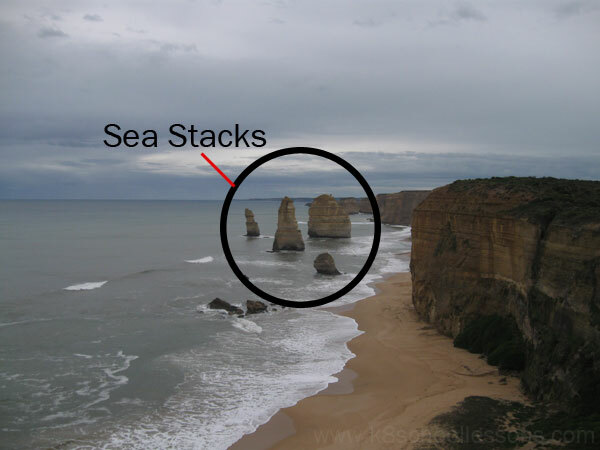 A picture of sea stacks at The 12 Apostles on Great Ocean Road, Victoria, Australia. 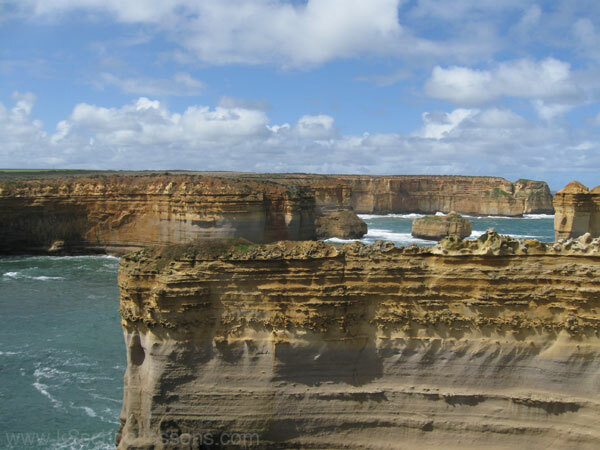 A beautiful view of sea stacks at The 12 Apostles on Great Ocean Road, Victoria, Australia. 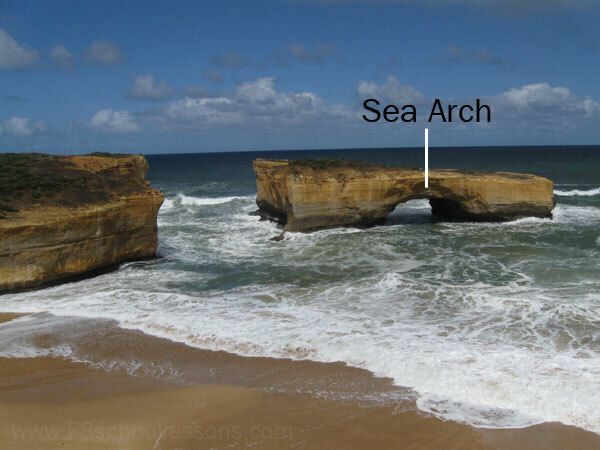 A sea arch is a sea cave that has been eroded all the way through by waves, leaving behind an arc of rock. A picture of a sea arch at London Bridge aka London Arch on Great Ocean Road, Victoria, Australia. 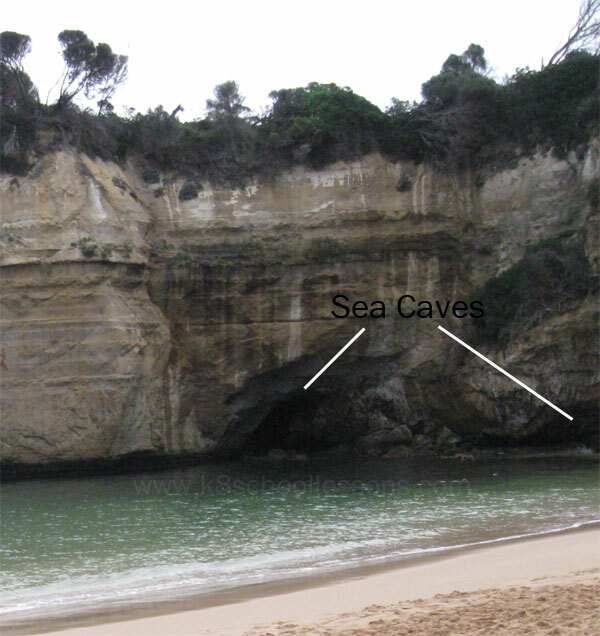 A sea cave is a hollow in the soft rock of a sea cliff or a headland, carved out by the eroding action of waves. 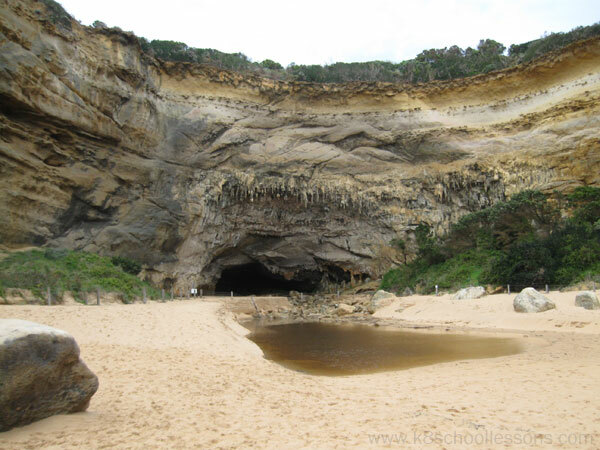 A picture of sea caves at Loch Ard Gorge on Great Ocean Road, Victoria, Australia. A salt marsh is a marsh in which the water that inundates (floods) the surface of the ground is salty. Most salt marshes form along coasts and are flooded and exposed by the action of tides. A sandbar is a ridge-like deposit of sediment, usually sand, that has built up in a river channel or at the mouth of a river. As the current slows around a river bend or as a river enters the ocean, the river deposits sediment to form sandbars. Sandbars are also found near beaches, where sand is carried offshore by waves. A spit is a long, narrow sandbar that is connected to the shore at one end. It is deposited and shaped by currents flowing along the shore, and often forms an arc around the mouth of a river. The wide mouth of a river where fresh water meets sea water. Following are some views of beautiful coastal landforms, formed by the actions of waves. 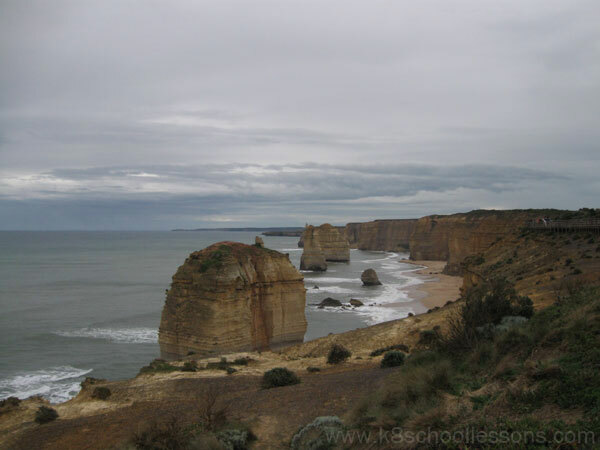 A picture of coastal landforms at The Razorback on Great Ocean Road, Victoria, Australia. A picture of coastal landforms at Loch Ard Gorge on Great Ocean Road, Victoria, Australia.